Recent revelations regarding the extraordinary surveillance to which citizens are subject, specifically the National Security Agency’s compilation of domestic telephone records, have created an uproar from the citizenry. Coupled with other governmental and private entities' efforts to track us through closed-circuit televisions, one wonders if our Founding Fathers would feel our 4th Amendment rights are being violated. In this painting the Great Seal of the United States is placed in a composition that protests the invasion of our privacy. The Latin verbage atop the seal – annuit coeptis - translated as “He [God] favors our undertakings” was graffitied to read abdico coeptis, meaning “He disapproves of our undertakings”. Additional graffiti includes “The Great Seal” modified to read as “The Great Steal”. 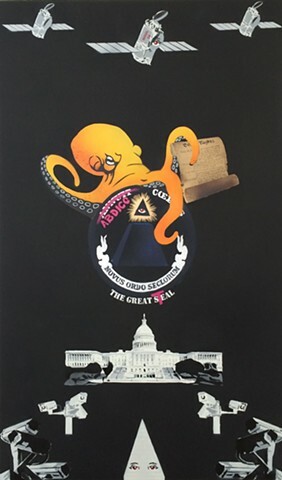 The Seal is smothered by an octopus seizing the Bill of Rights, the former image appropriated from a recent National Reconnaissance Office satellite launch mission patch which incredulously included the phrase “Nothing is Beyond Our Reach”.